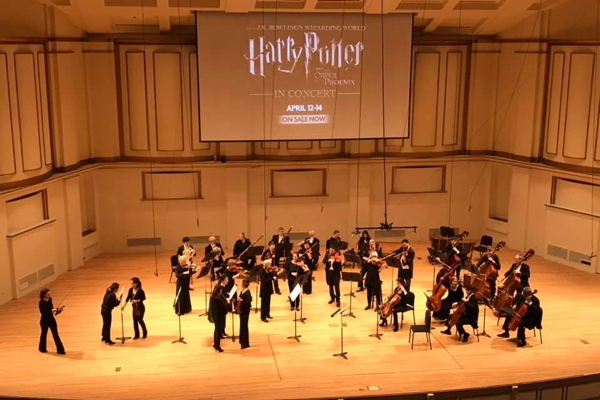 It's a tribute to the professionalism of our St. Louis Symphony Orchestra musicians that they can play like a single organism even when there's not somebody waving a stick at them. Yes, that's right: there was no conductor on the podium for the concert Friday night (March 15, 2019) of works by Beethoven and Haydn. Indeed, there was no podium at all. That's because violin soloist Anthony Marwood also filled the roles of conductor/leader ("leader" is concertmaster to us Yanks). When not actively playing his violin, he led the orchestra with a mix of eye contact and body language that kept everything moving along smoothly, even during the demanding Beethoven Violin Concerto that took up the second half of the program. Talk about being the hardest working man in show business! Historically speaking, of course, it wasn't all that unusual for the conductor to also be a member of the ensemble--most commonly the keyboard player. Handel, for example, got his first big break as an opera composer ("Almira," which he wrote in 1705 at age 19) in part because he had the very visible job of harpsichordist/conductor at a theater in Hamburg. Still, it's rare these days. It's also rare to see most of the orchestra (everybody but the cellists, whose instruments mandate a chair, and the bassoonists) performing standing rather than seated. I don't know whether or not that was common practice in the late 18th and early 19th centuries when the works on this weekend's program were written, but it did seem to allow for a degree of physical involvement with the music that wouldn't be quite so easy to come by had everyone been seated. All that exposed wood on stage also seemed to produce a bigger and brighter sound than I would have expected, given that Mr. Marwood was working with a smaller orchestra (a little over 30 musicians; very appropriate for the period). The concert opened with a light and charming Beethoven miniature, his "Romance No. 2." Written when the composer was in his late 20s, it's sweetly melodic with occasional glimpses of the drama that would characterize Beethoven's later work. It got an elegant and varied performance from Mr. Marwood and the orchestra. Up next was Haydn's Symphony No. 44 in E minor, published in 1772. It's known as the "Treuer" ("mourning") symphony mostly because of the contemplative tone of the Adagio third movement, although the dark and driven feel of the other three movements seems to fit with the nickname as well. It's one of several symphonies Haydn wrote that were inspired by the Sturm und Drang ("storm and stress") movement in 18th century German literature and music that emphasized drama and conflict. Conductor Kenneth Woods once called this symphony "a work conceived in fire and bathed in blood." I don't know about the blood, but there was certainly fire and dramatic power in Mr. Marwood's interpretation, especially in the contrast between his serenely contemplative third movement and powerful urgency of his fourth. There was some excellent playing from the band here as well, including some particularly lovely work in the second movement by Thomas Jöstlein and Chris Dwyer on horns. The Beethoven concerto took up the second half of the concert and here, again, Mr. Marwood proved as capable a conductor as he was a soloist. I would have liked a bit more drama in the first movement, but his playing was impeccable, including an impressive, flashy cadenza of his own devising, based on one Sarasota Music Festival director Robert Levin prepared for (I think) the Henle Urtext edition of the concerto. The second movement was wonderfully warm and heartfelt, with a nice solo by Principal Clarinet Scott Andrews, and the Rondo finale tripped along happily with strong dynamic contrasts, another striking Levin-inspired cadenza, and an irresistible sense of momentum that had Mr. Marwood almost to dancing in spots. My minor misgivings about the first movement not withstanding, this was a performance that had real visceral power overall. Friday night's concert will be repeated Saturday at 8 pm and Sunday at 3 pm, March 16 and 17, at Powell Symphony Hall in Grand Center. Next weekend, Gilbert Varga conducts the St. Louis Symphony Orchestra, along with cellist Daniel Müller-Schott. The program consists of "The Sorcerer's Apprentice" by Dukas, Lalo's Cello Concerto, and the Franck Symphony in D minor. Performances are Friday at 10:30 am and Saturday at 8 pm, March 22 and 23.